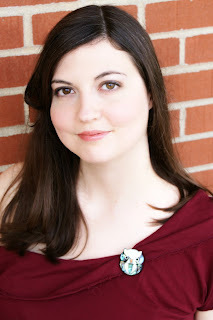 Laura Nowlin holds a B.A. in English with an emphasis in Creative Writing from Missouri State University. . In addition to being ambitious writer Laura is also an avid reader who believes that books allow her to live many lives in one lifetime. When she isn’t at home agonizing over her own novels Laura works at the public library where the patrons give her plenty of inspiration for her writing. She lives in St. Louis with her musician husband, neurotic dog, and psychotic cat. Our imagination is what makes us human! Our ability to create, connect, and care for these fictional beings is what sets us apart from other animals. When we read a story that touches our hearts, it helps us to remember that these other humans around us are also thinking and feeling creatures, deserving of our kindness and respect. When I first learned to read, I hated it! Then, when I was nine years old my family moved to a new city where I was ostracized by my classmates. I discovered the escape that books provided me, and I've been an avid reader ever since. I can't choose just one! I can't! I'm sorry but there are too many books I love in every genre! Humans are made of stardust. I love it when science is beautiful! Can you tell us when you started If He Had Been With Me, how that came about? I was coming to the end of a period of depression that had prevented me from truly writing for nearly a year when I dreamed the ending of “If He had Been with Me.” I got out of bed and wrote the first chapter and then went back to sleep. In the morning I was thrilled to find that I loved what I had written. What was one of the most surprising things you learned in creating Finn? I've been lucky enough to know some truly deep down good people, (my husband among them) who I had thought if I wrote them into a story the reader would say “That's not realistic, nobody is that good of a person.” As I was writing this book I was surprised by how good I was able to make Finny while keeping him stay realistic to most readers. If you could introduce Autumn to any character from another book, who would it be and why? I love this question! I think Autumn would get along great with John Irving's Owen Meany. Yeah, they would be very good friends. I think every high school has a guy like James. He's self-centered and charismatic, but he's still mostly a good guy. He has lots of friends that he does care for, but he also kind of sees them as accessories to his life, a supporting cast to the story of James. Eventually, something will happen to him that will make him realize he's not the center of the universe. Someday, something horrible is going to happen to you, something that should have been easily preventable, something unfair and stupid and irreversible. When that happens you will think that nothing will ever be good again. But you have to hang on, because God- or some people might be more comfortable thinking of it as “Life” or “the Universe” and that's fine by me- will eventually give you a glimmer of hope. Wait for that glimmer. Most of the time, if you ask me “How are you?” I'm going to lie to you. At least a little bit. I have the incredible gift of having been happily married for nearly six years now. Not a single day passes without us reminding each other how much we are in love. Four days ago I was dying of a head cold and stressed out about promoting this book and writing the next, and the bar where I work part-time couldn't find someone to work for me. I had a little break down and after I was done crying I felt better. And then my boss texted me that she'd found someone, so that was a relief. Here's the moral of the story: please tell all of your friends to buy my book so that I can quit at least one of my jobs! If you could do anything OR wish for anything that would come true, what would you wish? I know that I'm not in a beauty pageant here, but I think that it's a travesty that in this day and age we allow other humans to live in such extreme poverty that children die of hunger. So yeah, I would solve world hunger. Which would actually have the added bonus to moving us a step closer to world peace. 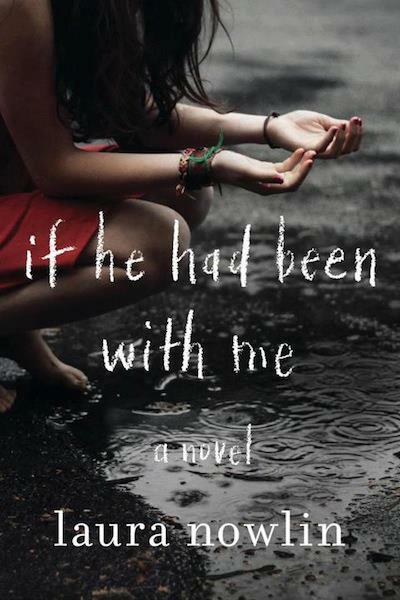 Laura Nowlin’s If He Had Been With Me is an emotional story of friendships, first loves, family and that one question that can be applied to any event in our lives, “What If?” The story begins with a very heart-breaking ending between two inseparable childhood friends, Finn and Autumn. Now they find themselves in different sides of the social spectrum and managed to survive without each other’s company. Although Autumn is happy with her boyfriend Jamie of two years, it has always been in the back of her mind if her life could have been different if things hadn’t ended with Finn. When she’s about to get the answers that has been distressing her for so long, a terrible tragedy occurs that places her in a totally different state of distress. Author Laura manages to bring this poignant story through brilliant presentations of Autumn’s recollections and Finn’s memories. She really knows how to capture a teenager’s voice. Autumn felt so real as there are no part of her that seemed like a YA gimmick. Although there were things she was unsure about, she was confident in other aspects. The one thing that stands out about this book is that it has a very unique ambiance. The writing style of Laura let out so many emotions that the words sometimes rip through your chest making your heart feel restrained. Readers are presented with a touching story that gets better as it progresses. The characters have a natural draw that readers cannot avoid. Once inside their world, the exit door suddenly disappears as readers are mesmerized by a story that only promises to get better. If He Had Been With Me is an emotionally-charged read that will grab your attention and interest right from the start. It deals with some very real subjects such as underage drinking and teenage pregnancy but it is written in a refined way with total admiration. The story of Autumn and Finny is one that will always be remembered. Be prepared to have your emotions shaken up a bit but it is totally worth the ride. 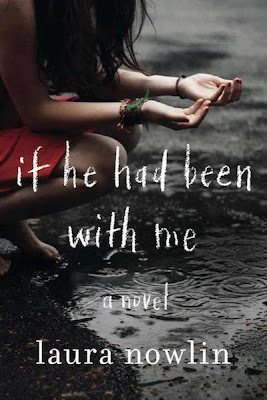 1 Winner will receive a Copy of If He Had Been With Me by Laura Nowlin.